Chevrolet Europe has debuted the new C7 Corvette Final Edition, which will go on sale in Germany and Switzerland later this year. 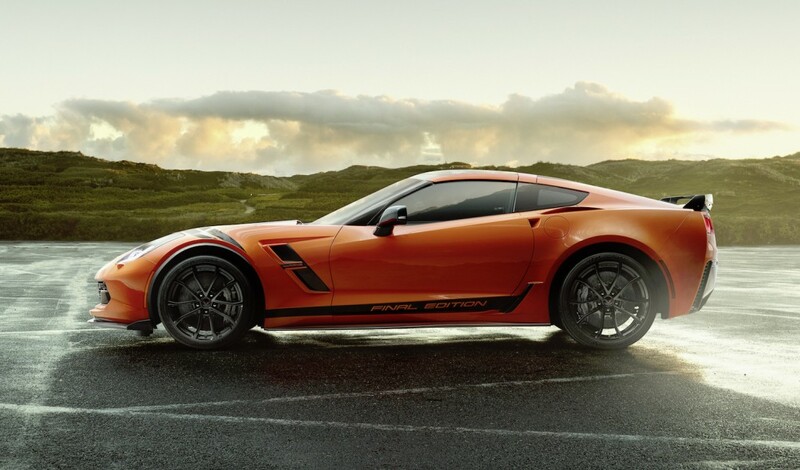 Both the C7 Corvette Grand Sport and C7 Corvette Z06 will be offered in Final Edition trim. All Final Edition Corvettes will come standard with Brembo carbon ceramic brakes, Competition sport seats, a performance data recorder and a visible carbon fiber aero package. The interior is set apart with Black Nappa leather upholstery, available contrasting stitching, sueded microfiber accents and a high-gloss carbon fiber interior trim package. The only available exterior colors will be Sebring Orange Tintcoat Metallic (shown) and Ceramic Matrix Gray Metallic. The C7 Corvette Grand Sport Final Edition will start at 116,500 euros in Germany and 130,000 Swiss francs in Switzerland. The C7 Corvette Z06 Final Edition, which features Chevy’s 650 hp 6.2-liter supercharged LT4 engine, will start at 139,500 euros in Germany and 153,200 Swiss francs in Switzerland. Both versions are available to order now, the automaker says. It’s not year clear if a C7 Corvette Final Edition model will be offered in the United States. The automaker recently rolled out the new C7 Corvette Drivers Series in Daytona, which feature exterior and interior color schemes inspired by the four full-time Corvette Racing drivers. It is believed the C7 Corvette will soon be replaced by the new mid-engine C8 Corvette, which is expected to debut sometime later this year before going on sale in 2020. Corvette Racing will also switch to a mid-engine platform car for 2020. So…we now know that C7 is dead in Europe after the 2019 model year. This begs the question…will the US end the C7 the same MY 2019? Or will, as the rumors and supposed information out there suggest, the C7 live on until 2020 MY and then part ways? My theory is that the C7 will live one more year, and only as a Grand Sport/Z06 or Grand Sport/Z06/ZR1. Base and Z51 go away, and they produce a last hurrah of the C7 for the whole model year. THE END? Another DUMB move, by GM!